October 20, 2016, 11:30 a.m. The state pension in its current form was set up in 1948, and has changed very little since then. During that time period, life expectancy has improved at a rapid rate, and the state pension is becoming increasingly unaffordable as a result. Because of this an interim report from the Independent Review of the State pension age last week outlined a number of ways in which the age at which people could access the state pension could be made fairer. The proposals included tying the state pension age to the life expectancy of geographical areas and occupations, taking into account how long people have been working and allowing early access at a reduced rate. The proposals are currently open for consultation. So what does the British public think about making changes like this to the state pension – do they see them as fair and worthy of support? We put the proposals to the public from two different perspectives to see how they felt. (For more on why we used two different perspectives, see the note at the bottom of this article). The public strongly backs proposals to allow people to access the state pension earlier at a reduced rate. More than half of people (57%) backed such a move, whilst just 22% opposed it – a net rating of +35. (Whilst not proposed by the interim report, an opposite scheme to allow people to pay into the state pension for longer in order to receive an increased rate was similarly popular at +34). The public is also amenable to tying access to the state pension to how long you’ve been in the workforce. One of the issues the review flagged was that those who enter the workforce at 16 years old will end up working longer to get the same pension as those who didn’t start work until, say, 21 years old. The public overwhelmingly support allowing those who entered the workforce at a younger age to get earlier access to the state pension – as many as 71% said they would back such a move, whilst just 14% would oppose it (net +57). Flipping the position still resulted in overall support for the proposals – just. Just over four in ten (42%) would support later access to the state pension for those who entered the workforce later in life, compared to 38% who would oppose (net +4). More controversial were proposals to tie the state pension age to the life expectancy of occupations. 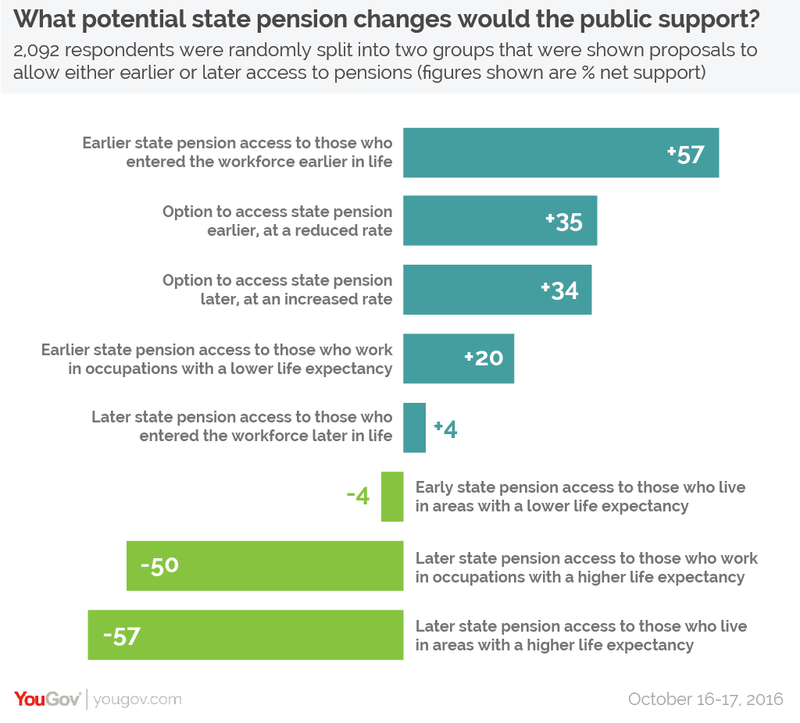 When asked if people working jobs with a lower life expectancy should have early access to the state pension, the proposals were supported 50% to 30% opposed (a net of +20). Put the other way, however, and people opposed later access to state pensions for people in jobs with a higher life expectancy by 66% to 16% (net -50). Flatly opposed in both wording scenarios was allowing people to access the state pension at different ages depending on the life expectancy of where they lived. Giving people in areas with lower life expectancy people early access to the state pension was opposed by 37% to 41% (net -4), whilst restricting people in areas with higher life expectancy until later was opposed by 69% to 12% (net -57). One of the issues with polling like this is the way people tend to apply the scenario in the question to themselves, which can result in wildly different responses depending on how the question is worded. Essentially, the behaviour being displayed is loss aversion - people like the sound of things that are giving something away, but dislike the sound of things that are being taken from them. So for instance, if you ask Person A if they support Person B getting the state pension earlier than them, Person A will tend to be more supportive than if they were asked if they support Person A getting the state pension later than Person B – even if those two questions outline exactly the same scenario. We therefore ran the survey under a ‘split sample’, randomly splitting the sample into two groups who were shown questions under different wordings – one proposing people getting the state pension earlier under certain circumstances, and the other proposing certain people getting the state pension later under certain circumstances. This allows us to present the full picture of how people feel about potential pension changes.